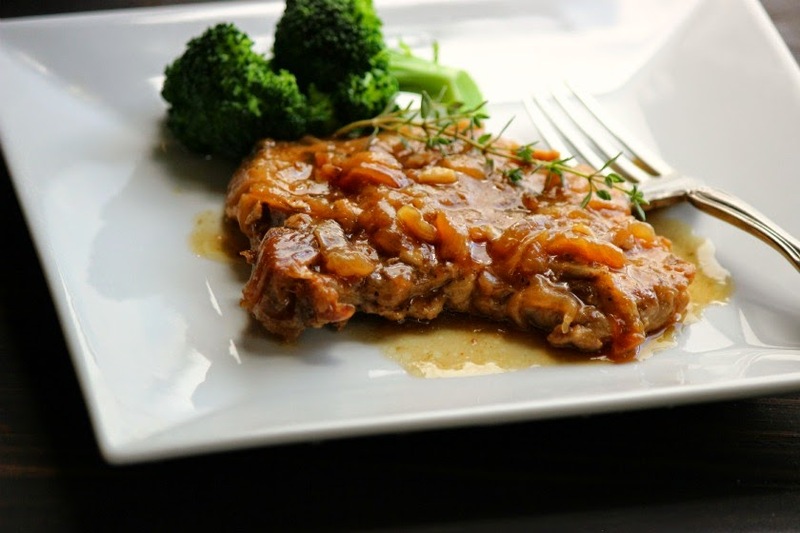 Thin pork chops can be difficult to cook without them being tough and dried out. 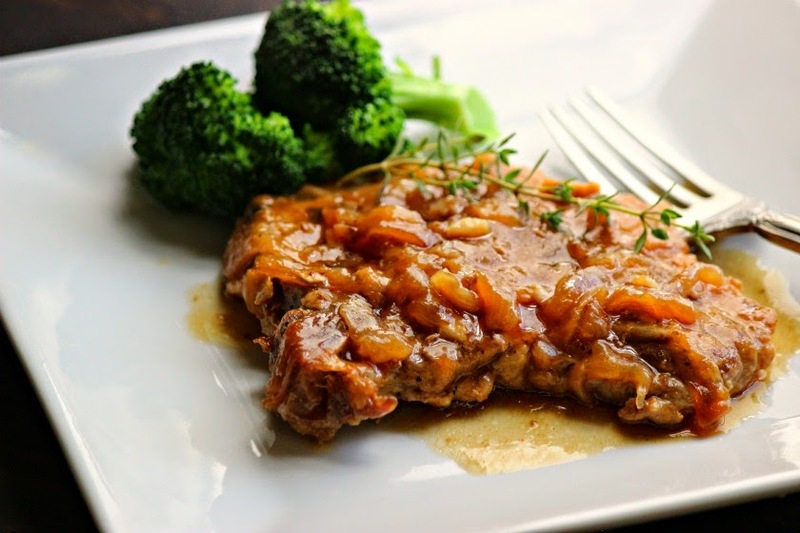 These smothered chops come out tender and moist with a silky flavorful gravy. 1 tsp. onion powder 1/2 tsp. paprika Salt and Pepper 1/4 tsp. cayenne pepper 6 bone-in pork chops, about 1/2" thick, trimmed 1-1/2 Tbsp. vegetable oil 1 Tbsp. unsalted butter 1 large onion, halved and sliced 1/4" thick 2 garlic cloves, minced 1/4 tsp. fresh thyme leaves (or dried) 3/4 cup beef broth 1 tsp. cornstarch 1 tsp. apple cider vinegar Preheat oven to 300 degrees F. Combine onion powder, paprika, 1/2 tsp. salt, 1/2 tsp. pepper, and cayenne in a small bowl. Pat chops dry with paper towels. Cut 2 slits about 2 inches apart through fat on edge of each chop. This keeps the chops from curling up. Rub chops with spice mixture. Heat oil in a large skillet over medium heat. Brown chops on both sides, 6 to 8 minutes and transfer to plate. Melt butter in empty skillet over medium heat. Cook onions until lightly browned. Add garlic and thyme and cook until fragrant. Stir in 3/4 cup broth, scraping up any browned bits, and bring to a boil. Return chops and any accumulated juices to pan, cover with aluminum foil and transfer to oven. Cook until chops are completely tender, about 1-1/2 hours. Transfer chops and onion to a serving platter. Bring stock to a boil. Whisk 1 Tbsp. water and cornstarch in a boil until no lumps remain. Whisk cornstarch mixture into sauce and simmer until thickened. Stir in apple cider vinegar. Season with salt and pepper to taste and serve over pork chops.